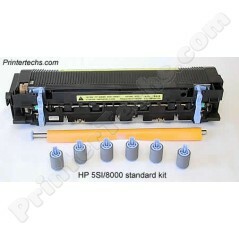 The Laserjet 5si and 8000 extended maintenance kit includes all of the parts from the standard kit with the addition of the manual feed tray pickup roller and separation pad, and three pickup rollers for trays 2, 3, and 4. Tray 4 is the optional 2000-sheet feeder which you may not have installed on your printer. In that case you would have an extra pickup roller, feed, and separation roller. The extra rollers in the extended kit are not included in Hewlett Packard's version of the maintenance kit. The extended kit is a kit that we have assembled exclusively at PrinterTechs. Call us if you have questions, 866-352-7108.